Today is Perfect Picture Book Friday where I link up with Susanna Leonard Hill’s fantastic group of writers who contribute a picture book review and related resources. I’m always looking for books with characters who are engaged in self-esteem building. Not only is this the case with my selection today, but the book is also a perfect choice for the upcoming holiday of Easter. I know that parents and teachers will enjoy the simple eco-friendly craft project at the end of my review. Do you know where the first chocolate Easter bunnies were made? Here is the scoop, according to picture book author and illustrator, Maria Claret. Synopsis: Bertie Rabbit and his sisters want to help their artistic father who paints beautiful Easter eggs, but they are too young. Bertie decides he is old enough to help his father and buys eggs with his own money, intending to decorate them and surprise his father. The little bunny is sadly disappointed when he trips and the basket tips over, breaking all of the eggs. Bertie’s mother makes a pot of chocolate to lift her son’s spirits…but when Bertie climbs up for a taste, disaster strikes and Bertie is covered in lukewarm chocolate. Bertie’s father looks at his son and has an ingenious idea…chocolate bunnies! Success often comes on the heels of failure! I love books that encourage children to keep on trying as they learn to master tasks and skills. Self-esteem is not built with empty praise…it is developed and strengthened as young children learn to do things for themselves. A child’s sense of self-worth increases as he takes these important steps…and learning to deal with disappointment is one of those steps. This is a sweet story about working together as a family…relevant with the busy hectic pace many families experience today…each family will find their own unique ways of spending quality time together. The illustrations are charming…they remind me of Beatrix Potter’s work. Angel Fire has an Easter/Spring Unit with many book and craft and cooking ideas here. Mama-Knows (colored egg picture below) has lots of recipes for coloring Easter eggs here. Children love arts and crafts! Here is an activity that will please every eco-minded parent. You will need: Hard-boiled white eggs (cooled), Q-tips, one or more of the following depending on how many colors you want: ¼ cup blueberries (blue), ¼ cup cranberries (red), 1 tsp tumeric (yellow), markers, a small bowl for each color, cover-ups, two small pots and water to boil. 1. Cover the work surface and workers to protect from staining (wear disposable plastic gloves if desired). 2. Boil ½ cup water, add crushed blueberries, simmer for 5 minutes and then pour into small bowl and let cool for a few minutes. Do the same for the cranberries. 3. Pour 1 tsp tumeric and ½ cup hot water in a small bowl, stir and let cool. 4. Put an egg into each bowl and let sit for 5-10 minutes, turning several times with a spoon. Then lift each egg out and let dry. 5. Use markers to add designs. 6. Tip: while waiting for the eggs to absorb the color, go on a color-naming hunt throughout your house…how many red, blue and yellow items can your child find? This entry was posted in children's picture books, Crafting with Children, Easter, family togetherness, Perfect Picture Book Friday, Reading with Children and tagged children, Chocolate, Easter, Easter Bunny, Holidays, Picture book, Spain by viviankirkfield. Bookmark the permalink. Encouraging books like this are always winners with me! I am a huge fan of Beatrix Potter so I know I will love the artwork too. What a GREAT pick! I love the name Bertie 🙂 I like how the story has a happy ending! I am going to ask my mom is we can do the home made dyes this Easter. Thanks for telling us about it! Wow, Erik…so glad you liked the natural dye Easter egg project. My kids always loved arts and crafts…the kitchen table was always a busy place with craft projects going on most of the time. Bertie is a pretty cool name! I love that the little bunny wanted to help out his family. Poor Bertie! The book sounds sweet and I love the activities. 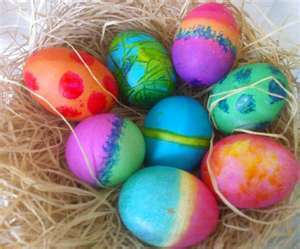 We used natural dyes a few years ago for our Easter eggs and the colors were lovely. We may have to do it again this year! I’ll find this one for Easter. I love holiday-themed books, and this one seems to have a great message. Thanks for always coming up with books with wonderful messages, Vivian. And thanks for sharing some sunshine with me! Susanna…again I thank YOU! If not for your PPBF, I would not have this amazing community to share with. 🙂 Glad you liked the story and craft…self-esteem is such an important component of a child’s life…affecting everything! Wow, I never thought of using natural dyes for the eggs. Makes me less hesitant to eat them when the dye bleeds through, too! Thanks as well for your thoughts on self-esteem, and for this book recommendation. As a mom of 4 young kids, issues of self-worth are very important to me! Four children…bless you. 🙂 How old are they? Another great selection with wonderful activities. You are so creative. I would never had thought of making natural dyes for Easter eggs. Enjoyed your thoughts about self-esteem. This book has a lot packed into it. 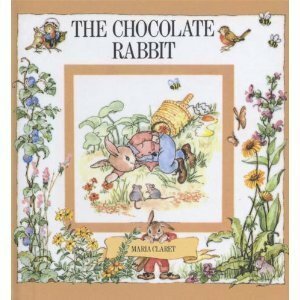 I’m going to order this book from the library, since I’m looking for books with an Easter theme. It is a really sweet story…and perfect for Easter. I think books about characters building self-esteem are so valuable. This book looks and sounds adorable. And a perfect pick for Easter. Thanks Vivian! Hi Vivian, I’m glad to have discovered your site through the Perfect Picture Book meme. This looks like a very timely book indeed and I loved how you incorporated this activity on painting easter eggs. While I do think that my ten year old daughter may be too much of a tweener to participate in Easter egg hunts, I’m sure that she’d still enjoy this painting activity. Thanks for sharing the book as well. Thanks, Jake. I appreciate you stopping by here! So true about success. Another great book and a fun craft. We may try the egg coloring this year. Thanks. Glad you liked the book and craft. It would be fun to do a little cooking activity with berries…maybe do pancakes with berry faces…or a fruit salad with berries…and then also use the berries for the craft. Does Enzo like blueberries? Like Susanna I immediately thought of Breatrix Potter when I saw the book cover. What a lovely story and message. Loved the Easter activity and have already copy and pasted it so I can have a go with my little nephew when he comes visiting in August. (I know its a long way off but I’m so excitied and collecting lots of activities we can do together). Thanks Vivian. Thanks for the kind words, Beth…glad you liked the book and activity! I know what you mean, People with a healthy high self-esteem is one who views life in a positive way. Although self esteem development should generally start from early childhood, it is never too late to fix past mistakes and try to build self esteem in adulthood. Self esteem is how one views himself, either negatively or positively. Thank you for stopping by and commenting…when we have confidence and a strong sense of self-worth, we are more willing to accept new challenges. You are unbelievably creative! Thanks for all of the wonderful activity ideas to go along with the wonderful books you suggest!